The term “Green Man and Gatekeeper” or “us” or “we” refers to the owner of the website. The term “you” refers to the user or viewer of our website. The information contained in this website is for general information purposes only. The information is provided by “Green Man and Gatekeeper” and whilst we endeavour to keep the information up-to-date and correct, we make no representations or warranties of any kind, express or implied, about the completeness, accuracy, reliability, suitability or availability with respect to the website or the information, products, services, or related graphics contained on the website for any purpose. Any reliance you place on such information is therefore strictly at your own risk. Through this website you are able to link to other websites which are not under the control of “The Green Man and the Gatekeeper”. We have no control over the nature, content and availability of those sites. The inclusion of any links does not necessarily imply a recommendation or endorse the views expressed within them. Every effort is made to keep the website up and running smoothly. However, “Green Man and Gatekeeper” takes no responsibility for, and will not be liable for, the website being temporarily unavailable due to technical issues beyond our control. 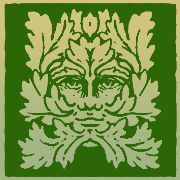 This website and its content is copyright of “Green Man and Gatekeeper” - © “The Green Man and the Gatekeeper” 2008, 2009, 2010, 2011, 2012, 2013, 2014, 2015, 2016. All rights reserved. If you have any problems or questions regarding your order please contact us using the e-mail address below. All orders are dispatched and tracked using Royal Mail Recorded Signed For Service and will require a signature on delivery. You may return any stock item in its original condition to us with 14 days after the day of receipt. We will issue a full refund for the price you paid for the item for correctly returned orders. Items must be returned at customers own cost. It is recommend that you use a recorded mail service for returning items. We cannot accept returns of bespoke items that have been made to order or personalised at your request. Undyed leather will mellow naturally with age, and darken to a rich warm brown. Over time colour changes may also be seen in leather. Dyed items may give off some colour, so care should be taken with paler fabrics. Design may vary slightly from that shown as all items are unique, no two are made the same.